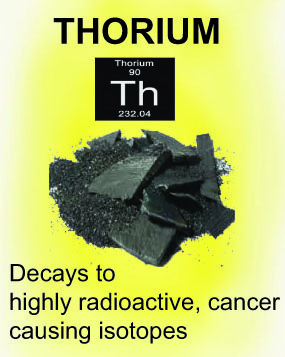 What’s the radioactivity level of Lynas’ refinery thorium wastes? “The WLP residue, although classified as radioactive material, has the same radioactivity level as the feedstock material (rare earth ore concentrates) used in the Lamp process (about 6 Bq/g of Th)”. (More accurately, this should read 6Bq/g of WLP – pure Th232 has a specific activity of 4070 Bq/gm of thorium, so 1655ppm of Th232 in WLP residues would contribute 6.7 Bq/gm of WLP). In a stable equilibrium, the number of nuclear decays for each of the subsequent radioactive progenies in the Th232 decay series is equal to the number of nuclear decays of Th232. Hence the specific activity of WLP would be 10x the Bq counts contributed solely by Th232 nuclear decays (followed by nine other nuclear decays in the decay chain of progenies in the figure above). In line with this, p.38 of the Radiological Impact Assessment (Nuklear Malaysia, June 2010) stated that Lynas’ refinery would produce “32,000 tons per year of water leach purification residue (WLP) with radioactivity concentration of 61 Bq/g containing 1,655ppm (6.62 Bq/g) thorium-232 and 22.5ppm (0.28 Bq/g) of uranium-238”. Likewise, the Preliminary Environmental Impact Assessment includes a table on page 5-55 which states that the WLP contains 1655ppm of Thorium Oxide and 22.5ppm of Uranium Oxide, for a total specific (radio)activity of 62.0 Bq/g of WLP, i.e. 10 times the specific activity announced. Lynas should explain why it is taking the boundary case (equivalent to a one-step decay of Th232 to a non-radioactive progeny), rather than in a decay chain including nine other radioactive progenies, occurring in a low-permeability clayey mass of WLP residues, which would retain much of the short-lived Thoron 220 and its decay progenies, and thus approximate a closed system tending towards secular equilibrium.